Sunnymead Farm Cottages01825 733618work Self-cateringTwo very comfortable one-bedroom cottages adjoining one another. They are situated at the end of 200 metres of private drive in the grounds of the owner's house, set in 12 acres of orchards & gardens full of birds and wildlife, with a large pond. The Ashdown Forest is 2 miles and Tunbridge Wells 11 miles away. The nearest pub is 5 minutes walk and closest shop about 2 miles. Russets Cottage has a very well equipped kitchen/dining-room. There are steep narrow stairs up to a galleried sitting room and double bedroom; both rooms have views over woodland. The sitting room has a digital flat screen TV. The double bedroom has a King-sized (5ft) bed. The en-suite bathroom/WC has an over bath shower and sloping ceiling. Pippins Cottage has ground floor accommodation. The living/dining room has a step up to a very well equipped kitchen with a door leading to a delightful courtyard. The sitting room has a TV/video. The bedroom has a super king-sized (6ft) zip and link bed, which can, if requested, be separated into twin beds. From the bedroom there is a door that leads into its own small private garden. There is an en-suite bathroom/WC with an over bath shower. A travel cot and highchair are available for a child under two years. The accommodation is all on the ground floor. Each cottage has constant hot water, full central heating, duvets (winter and summer weight) or blankets. Both kitchens are in Shaker style equipped with an electric oven and hob, microwave, fridge/freezer, washing machine/dryer and dishwasher. 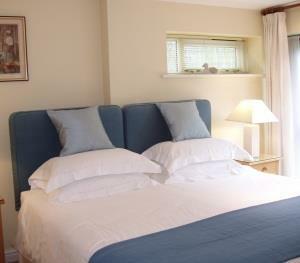 Each cottage has a DVD player with a small library of videos/DVDs and books, TVs in bedrooms, wireless internet access. There is ample car parking. The rental prices include all hot water, heating, towels and linens. Linen and towels are changed weekly. Two very comfortable one-bedroom cottages adjoining one another. They are situated at the end of 200 metres of private drive in the grounds of the owner's house, set in 12 acres of orchards & gardens full of birds and wildlife, with a large pond. The Ashdown Forest is 2 miles and Tunbridge Wells 11 miles away. The nearest pub is 5 minutes walk and closest shop about 2 miles. Short breaks and flexible bookings are available on request. South off A26, down Chillies Lane, turn right down Perrymans Lane.